Marvel’s Agents of S.H.I.E.L.D. returns to ABC with the Season 2 premiere episode, “Shadows.” Many viewers will say it’s been a long road, but “Shadows” shows how Agents of S.H.I.E.L.D. has come out of its first season a stronger show in nearly every way. 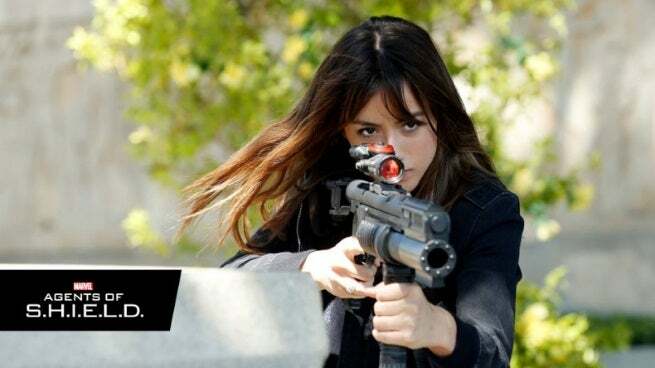 The episode’s plot involves a particularly important 084 from S.H.I.E.L.D.’s history. A deal gone badly sees information on the object and its location fall into Hydra’s hands. As a result, Coulson, now S.H.I.E.L.D.’s director, must gamble everything he’s accomplished so far in order to make sure the object doesn’t come into Hydra’s possession. “Shadows” shows how the series has grown since its first season in two major ways. First, the show has a new sense of purpose that was lacking through much of Season 1. In Season 1, Coulson’s group on The Bus felt like some not particularly special part of the huge S.H.I.E.L.D. organization, going off on largely arbitrary, “084 of the week” style adventures. As the showrunners claimed was the point, these adventures did allow audiences to grow to know these characters before the Hydra hit the fan during the season’s final arc, but it still felt meandering at aimless at times. Coulson’s team is no longer just part of S.H.I.E.L.D. After the fall, Coulson’s team is the S.H.I.E.L.D. Coulson being the head of S.H.I.E.L.D. makes every move he and his team makes feel much more significant, especially since S.H.I.E.L.D. is now an outlaw organization still being pursued by the government, rather than a part of the establishment. The long game of rebuilding S.H.I.E.L.D. into the force for good that it once was gives the series a sense of purpose and forward momentum. There will likely be a lot of “084 of the week” style setups played out as part of this larger mission statement – this episode is basically that, with an added sense of gravitas – but at least now it feels like the team is going on these missions for an important reason rather than just because they needed something to do. The other way in which Agents of S.H.I.E.L.D. feels changed is that the characters have a new sense of being lived in. Coulson’s crew felt overly clean, fresh and new in their first season. Without spoiling anything from the premiere, most of these characters have changed significantly since they were introduced, bearing emotional scars and baggage from last season’s revelations and betrayals. The only exception to this is Melinda May, who remains the stone faced warrior woman of the show. Meanwhile, Skye has progressed from the doe-eyed rookie point-of-view character to a capable agent in her own right, under May’s tutelage. Coulson’s progression is more subtle, but having the responsibilities of director weighing on his shoulders has changed his priorities, leading him to make decisions differently than he would have when it was all about his little S.H.I.E.L.D. family on The Bus. Ward, Fitz and Simmons have undergone even more drastic progressions, directly as a result of Ward’s betrayal last season. As one might imagine, Ward’s relationship with Skye and the rest of the team has been damaged, seemingly beyond repair. The Fitzsimmons relationship also bears significant scars following Fitz’s heroic sacrifice to save Simmons from Ward’s deathtrap. Fitz’s state is one of the lingering questions left over from last season’s finale, and the way that Vincent Misiano’s directing of Jed Whedon and Maurissa Tancharoen’s script plays with audiences expectations regarding his wellbeing is one of the episode’s highlights. There’s also the introduction of several new characters, including new principal cast member Nick Blood as Lance Hunter. These characters largely have backgrounds as mercenaries, which gives them a slightly greyer attitude compared to the shining knights of S.H.I.E.L.D. These characters serve as a nice counterbalance to last season’s crew, as they’re willing to question Coulson in ways that the other characters’ loyalty and fondness doesn’t allow. At one point during the episode, Coulson delivers a monologue about how S.H.I.E.L.D. lives in the shadows now. It’s what they have to do in order to continue the fight and to continue saving lives. If anything, this episode proves that the shadows is where Agents of S.H.I.E.L.D. belonged all along, infusing the show’s world with just a touch of darkness that makes it much more interesting. Entering Season 2, the show finally feels fully formed, and fans will likely be eager and excited to see how Coulson and his team navigate the shadows as they try to rebuild S.H.I.E.L.D. from scratch.